The brewery culture in C’Ville is thriving. 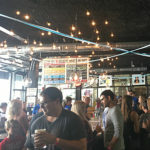 With four new breweries opening up in the past few years, and several others that have been around in the area for a while, there are so many options for craft brew loving visitors. In Charlottesville and the surrounding areas, we can think of 10 worth visiting. Today we’re featuring some of the classic, favorite breweries that have been around a bit longer. Another bonus is that these breweries are close to the Inn! Starr Hill Brewery can be found in Crozet, just over 10 minutes from the Inn. The tap room has a modern, industrial feel with a large bar and ample other seating. There is also a patio area where there is often a great, local food truck. You are welcome to bring other food with you, as well. We recommend Crozet Pizza as a great pair with beer if you are looking for a casual dinner. We love the selection of beer at this brewery- there really is something for everyone! Whether you enjoy a classic, malty lager or a unique, fruit infused IPA, they’ve got it and everything in between. Starr Hill also has events in the tap room often. You’ll find anything from a local jam session to larger events for holidays like Oktoberfest and St. Patrick’s Day. 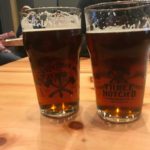 Three Notch’d has been a well loved brewery in Charlottesville for years, and just recently they’ve expanded to two locations- a new location that is a restaurant/ brewery (with delicious food!) and their old location that is now their “sour house.” Both locations are downtown. Three Notch’d has a cool, historic theme that fits right in with the historic culture of Charlottesville. You can see the story behind the name and the way they name their beers on their website. Their restaurant is family friendly while their sour house caters to sour beer lovers, or those that are adventurous enough to try! We personally love their Hydraulion Red. Walking distance from the Downtown Mall, we suggest this place for a beer after Friday’s After Five, or just after an evening walking and enjoying the downtown area. Champion has some of C’Ville’s favorite beers, like their Shower Beer, a Pilsner, and their Missile IPA. Their taproom is very casual, and they have a large outdoor seating area. Recently they’ve started serving their own food- a small menu of bar food that goes great with their beer! If you’re searching for some of the favorite breweries of C’Ville locals, look no further than this list! Of course, with the growing number of breweries in the area, it’s hard to choose just three- but these breweries are well loved, well established, and simply brew and serve great beer! This entry was posted in Breweries, Charlottesville, Charlottesville VA and tagged breweries, breweries in Charlottesville, charlottesvilleVA, Cville by Foxfield Inn. Bookmark the permalink.